The US presidential candidates are not the only ones scrambling to put together a credible interpretation of the situation in Iraq these days. Today, Pentagon released its latest report to the US Congress, entitled “Measuring Stability and Security in Iraq”… Full story here. 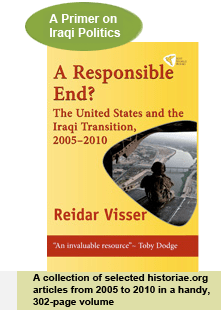 This entry was posted on Wednesday, 1 October 2008 15:25 at 15:25	and is filed under Iranian influence in Iraq, Sectarian master narrative, US policy in Iraq: Leverage issues. You can follow any responses to this entry through the RSS 2.0 feed. Both comments and pings are currently closed.